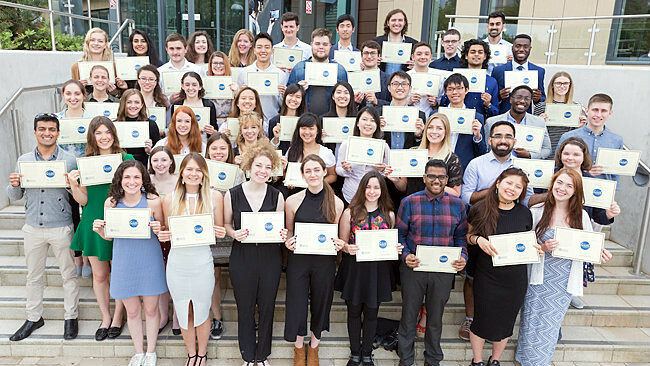 A group of proud students gathered in 10W last Thursday to celebrate their achievements at the annual Bath Award ceremony. The University devised The Bath Award nine years ago to boost students’ abilities when applying for jobs in an economic climate where good jobs attract hundreds of applicants. By completing the Award, students know how to make job applications stronger, and it also acts as excellent preparation for interviews. He also praised the staff who make the initiative possible: “The Bath Award is a great example of cross-University collaboration – managed by the Students’ Union on behalf of the University, but with assessors from departments across the institution who work tirelessly throughout the year marking submissions, all on a voluntary basis. “The Bath Award has received a record number of submissions this year – a 27% increase on 2015-16 and a very high pass rate thanks to the hard work and determination of students and to the quality of feedback provided by the team of Bath Award assessors. Amanda Harper, Director of Administration in the Faculty of Science, is one of the 43 Bath Award assessors drawn from academic departments and faculties, the Students’ Union, Library Services, Widening Participation Office, Academic Skills Centre, Careers Service, Sports Development & Recreation and also Santander Universities. Amanda says she finds being an assessor “hugely rewarding” and at the ceremony described why she volunteers: “In my previous role I had a large amount of student contact and when I moved into my current role, I missed it hugely, so I was really pleased when the opportunity to be an assessor came up. “It obviously doesn’t involve face to face contact, but it does give me the chance to stay in touch with the student body and to feel proud of them and their achievements. Careers Advisor Sue Briault is another assessor who has been involved since the beginning of The Bath Award. She has advised countless students on CV writing and other job hunting skills, and attended the ceremony just weeks before she retires. “I was very pleased to have my photo taken with Keon today. I first met him as a very shy first year and it has been wonderful to see what he has achieved. “We have met many times over the four years he has been here. He sent me the most touching card today to thank me for my help. If you are interested in becoming an assessor for The Bath Award, please contact Samantha Chaffey. To achieve the Award, students need to complete at least 100 hours of extra-curricular activity and show that they meet standards in key skills such as communication, teamwork, leadership, commercial awareness, problem solving and digital practice. The award features on the student’s degree transcript which goes to employers when they apply for jobs. The Bath Award is continuously being developed and improved to reflect the changing needs of students and employers. This year, a brand new Cultural Awareness strand has been introduced, which was developed by staff in the Academic Skills Centre, Foreign Languages Centre and Students’ Union. Read what some students who have completed The Bath Award this year say about the experience.